I stick to BB creams these days to even out my complexion because my skin is behaving well and I don't have very prominent dark circles and blemishes to cover up. I turn to foundations only on special occasions like when attending a wedding or a party and when I do apply foundation I make sure it is applied evenly giving me a flawless natural finish. 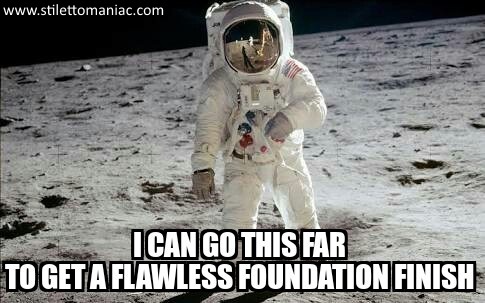 Not getting the perfect foundation finish and coverage is one of my biggest make up nightmares. I once ended up with flaky foundation while getting ready for a wedding. I was in a hurry and the foundation dint look too streaky so I went ahead and applied gloss, liner, blush and headed out. At the wedding when I checked myself in the mirror I shocked myself, the streaky application highlighted itself in the beautifully lit up wedding hall and many aunties actually suggested me some nuskhes and creams thinking i was having skin problems! Since that ill fated day I make sure my make up base is flawless and never ever compromise on the natural finish even if it means spending 30 minutes in front of the mirror with my foundation. When I started off my make up journey BB creams hadn't entered Indian market and I used to mix foundation with my moisturizer to make a tinted moisturizer and apply it everyday. Most of the times I ended up with a cakey finish even after spending a lot of time blending it patiently into my skin . That's not the case anymore, now I have learnt from my mistakes and discovered tricks and tools to get a flawless fantastic foundation finish. 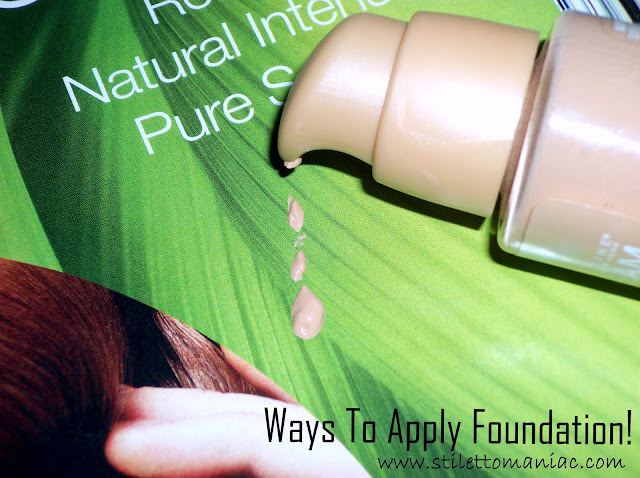 Here I will share with you 3 fantastico ways which I use to apply my foundation. See which method works best for you to help look peppy and natural at the next event you attend. This is how I started off applying my first foundation and this works best for make up starters who don't want to invest in expensive make up tools just yet. Using fingers also gives you a lot of control over the kind of coverage you want to attain . Warmth from your fingers helps in blending easily but you need to work by dividing your face in sections, dabbing your foundation in light circular motions. Give extra care to areas under your eyes and spots around your nose and lips, for this just pat your ring finger for more control. The reason most people avoid using fingers is because it is unhygienic and can transfer germs from your fingers on to your face leading to nasty breakouts. So make sure you wash your hands before using your fingers. Method suitability: For beginners or when you are in a hurry. This is my current favorite way to work with foundations as it can easily blend in even toughest of foundations. This method gives a very even flawless finish. Using wedges i can nicley blend in foundation in corners around nose and the area under my eye. Make up sponges are easy on the pocket too. I use make up wedges from Basicare which are super soft and washing them after use is also a breeze. The thing with make up sponges is they end up using a lot of product absorbing most of it but it doesn't matter to me because I am sure I will anyway not be able to finish my foundation before expiry . If you want sheer to medium coverage I suggest you try make up sponges. Just wet a sponge, squeeze out the water so your sponge is just damp and not soaking wet. Now lightly dot foundation all over your face and neck and blend and pat using sweeping motions. If you think the finish is too sheer then build up by layering in more product. Using a sponge gives you a very natural finish and building up coverage is easier this way. Always make sure to keep your sponges clean and discard them when they get tough. This is a very professional way of applying foundation. You can get high coverage with a foundation brush, just buff the product onto your face in downward motions. The problem with foundation brushes is you need to use a good quality brush to attain the natural finish and foundation brushes dont come cheap. I suggest you start of with sponges and then move on to foundation brushes. Invest in a good brush from MAC or real techniques because if your foundation is streaky your whole look is ruined . Foundation brushes are also very difficult to clean and using unclean brushes will give you skin problems in the long run. 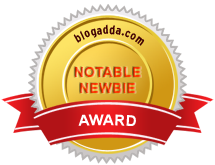 The beauty blender which is a new kind of a make up sponge is making a lot of waves in the beauty world and I am reading a lot of fabulous reviews about it. I am looking forward to try this method of foundation application because sponges are so my thing but one look at the price of the beauty blender makes me roll my eyes. Hoping to see some similar economic options in Indian market soon. Which method do you use to apply a foundation ? I too use all these tools depending on the texture of foundation!! !